Heading straight into June and with the glorious days of July, August and September ahead, we find ourselves with Summer upon us. As an American, you may very well find yourself comfortably sitting with the illusion that London (and England as a whole) is a drab and colorless city, with summers as cold as many cities’ winters. If so, you’re in for quite a surprise once summer swings around. If you’re here in the summer, you’ll often see days climbing to 25 °C (77 °F) on the thermometer and sometimes even as high as 30 °C (86 °F). For the neophyte, it’s the kind of weather that means seeing London and its environs in a manner befitting seeing any new city – on your feet and at a leisurely pace. Start off with a visit to the London Eye on a clear day. As well as giving you an eye popping view of the city and its surrounds, taking a ride on this popular tourist attraction will give you a bird’s eye view of the city. It could show you places you have yet to visit and help you sort out your itinerary. As for drab, grey and colourless, banish these images from your mind. 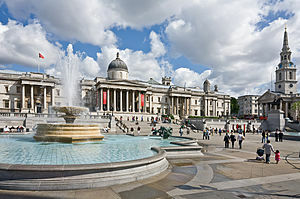 Places like Regents Park, Notting Hill and the open space of Trafalgar Square really do help to show off the colour and vitality that London has to offer. And nothing will help to clear the stereotype of a grey and dreary stories from your mind quite like the Chelsea Flower Show, the unofficial kick-off to summer. This is a city that revels in its summer, with the season being a veritable riot of things to do and see. From music concerts to public entertainment to sports events, none are more exciting than the highlight of summer in June, The Wimbledon Lawn Tennis Championship, which will see the world’s top tennis players gather to face off for that tournament’s prestigious trophy. As an American moving here, it’s an event which should go straight into your diary. A drab and colourless summer? Perish the thought.